Like us, bees need space in which to live their lives. They need a place to raise brood, to store honey and pollen and more. In the spring and summer, a colony can expand quite dramatically, both in numbers and in the space needed. When space starts becoming too limited, bees need a solution. Their solution is to swarm. But there is a broader reason why bees swarm, beyond simply needing more space. When we think of bee reproduction, we think about the queen laying eggs, the eggs emerging as adult bees and so on. This represents reproduction at the level of the individual bee. When bees swarm, a single colony becomes two. This can be considered reproduction at the colony level and it is an essential element of the way bees live and survive. The most obvious and easy-to-assess reason bees swarm is simply to resolve a lack of space. While this happens in nature when a colony grows beyond the capacity of its home, it is particularly common in the small, purpose-built wooden boxes we call a beehive. We actually cater quite well for our bees, using structures that be expanded with relative ease. This allows the beekeeper to hopefully anticipate the potential for swarms and act accordingly. But that isn’t always possible, and bees may eventually swarm. As with anything associated with bees, there is nuance to why and how they do this, but that is the swarm process, in a nutshell. The colony acts, in many ways, as an organism unto itself. The collective “wisdom” of the colony greatly outweighs the awareness of any one bee. Like any organism, the colony needs to survive and is also motivated to reproduce. It is through swarming that the colony reproduces. The creation of two colonies from one is a natural, positive event supporting the rapid growth of a colony. With a queen in each colony, separate brood-rearing efforts can take place, therefore accelerating the number of bees created collectively. As we discussed above, some trigger will exist to initiate the swarming intention. In our example, we have a beehive where the colony is starting to exhaust the space available, as it fills frames with brood and honey. So, the colony elects to swarm. Queen cups are created by workers on a regular basis. But the queen will not ordinarily lay eggs in them. That changes when swarming is imminent. Her laying an egg in a queen cup illustrates an amazing level of planning – she plans to leave and she is also preparing a queen that will take over in the existing hive. Up until this point the old queen has been laying eggs and is heavy. She isn’t in a position to fly well. Since she will be leaving soon, she needs to lighten up. The workers achieve this by reducing her feedings and she will stop laying eggs. This means there is a gap in the egg-to-adult timeline of the colony. Soon after all this preparation the swarm will start. The queen and 50% – 60% of her offspring will leave. There are usually a few steps to this relocation to a new home. Leave the hive and temporarily move to an interim location. In what is one of nature’s more dramatic events, tens of thousands of bees will stream out of the hive together. They will choose a nearby location as an interim place to rest, keeping in mind that the queen isn’t a great flyer at this point. This initial stop might well be within a stones throw of the original hive. Scout the nearby area for permanent locations. With the swarm clustering around the queen at the interim location, scout bees will then start checking the area for suitable final locations. At this point some magic happens, including a remarkable form of debate and voting among the scout bees. This is described in glorious detail in the beautiful and iconic book Bee Democracy by Thomas D Seeley. Move to the final location. With that decision made, democratically, the swarm will fly off to the chosen location and begin its life in their new home. The group of bees swarms is called the prime swarm. Back at the original hive, the first queen will soon emerge from her queen cup. She will hunt down her as-yet-unborn sister queens and kill them while they remain in their queen cups. She will be helped by some worker bees who help clear the wax capping, so she has access for the killing. Once she has completed that process, she now becomes the queen of the initial hive. At this point, there is another direction the colony can take. The new virgin queen and workers may ALSO swarm, again with a significant number of bees from the colony, though smaller than the original swarm. This secondary event is called an after swarm. In rare cases, the process may occur again and again – multiple after swarms – until the hive is depleted. How can I help prevent the chances of a swarm? Depending on the type of beehive you use, you have the option to add new boxes to expand the available space. The underlying conditions are the first sign of a potential swarm. If your bees are expanding rapidly, are in full-blown brood-rearing mode and storing large amounts of honey, you should be carefully monitoring the use of frames within the hive. It is your role to watch for these signs and take early, proactive action to avoid swarming. Swarming is not bad! As a beekeeper, swarming bees can be an excellent source of bees when looking to establish a new hive. Catching a swarm is one of beekeeping’s most exciting and satisfying steps and it is important for the beekeeper to realize the opportunity here. Catching a swarm is not quite as scary as it might seem at first. PerfectBee doesn’t recommend this as a source of bees of the first time beekeeper, but as you gain experience it’s a very viable option. For the layman, a swarm of bees is sometimes a terrifying thought, even though that concern is generally overstated. 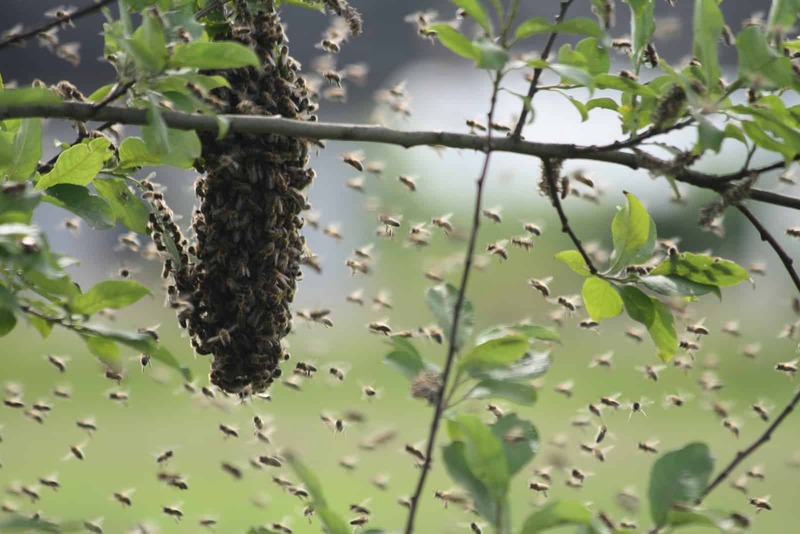 Around the country, beekeepers promote “swarm catching” services. Given that the end result may be a new colony – for free or even for a small profit – it’s something of a win-win, when done for the right reasons. I am new to this beekeeping, I got my bees when I lure them in a box. but these bees are Apis cerana, not the melefera. They swarm and I was too late. I tried to catch the swarm without proper gear. Not even a globe in my hand. It went from bad to worse when the bees are injecting their venom to my hand. The ending was I let them go after I discovered that I was allergic to a bee sting. My chest began to feel heavy, and also my breath was heavy. I never went to the hospital and I just waited for the venom to subside. I slept early the whole night. the first time that I had a good sleep by the way. When the morning comes I just thank god for the first breath that I took. I went out to see if the cluster of bee was still there. To my surprise, they stayed there in the initial spot two days before they took off. I don’t know yet if they went inside the lure box that I put beside them. When I get home from my office I will find out. How does a novice be keeper (lover) recover a swarm?